Welcome to the new year. Ready for a fresh start? The holidays are behind us and we’re back to full speed. And some of us didn’t quite get the rest we needed. Sometimes the stop-start of the holidays can be a little jarring. Before you know it, it’s mid-January and all your good intentions of starting the year right have come to nothing. We understand, and we’ve got something to help. This month in the Courageous Storytellers Membership Site we’re focusing on how to take care of yourself. 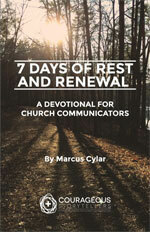 One of the powerful resources we have is a 31-day rest and renewal devotional. Written by former pastor and church communicator Marcus Cylar, it’s meaty and it will help you dive into Scripture and see how God provides for you, the busy and over-worked church communicator. The full 31-day devotional is available to members over at Courageous Storytellers, in both PDF and Kindle versions. But we’ve also got a free, 7-day sample of the devotional you can download and check out right now. You just need to sign up for our email list, where we send out helpful resources every week (folks on the list received this devotional yesterday). So take a few minutes each day to rest and be renewed by the Word of God. It’s a good way to start the year. If you need even more rest, the Courageous Storytellers Membership Site is full of resources, including productivity tips (here’s a sample), a spiritual retreat guide, tips on how to say no without being a jerk, a self care webinar with Kelley Hartnett, and more. We also have loads of resources to help you avoid church communicator burnout.